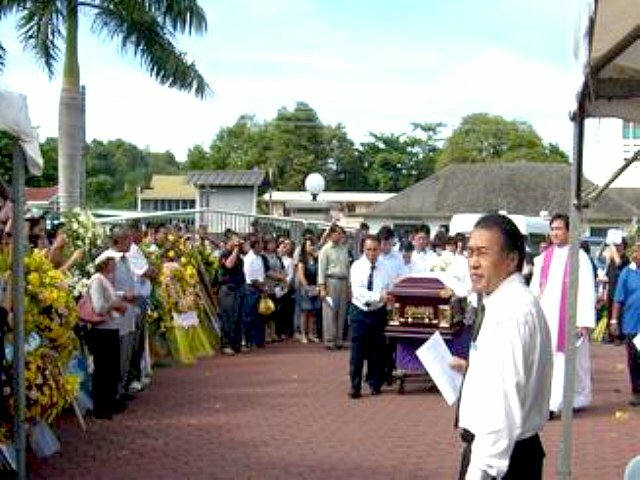 Father Anthony Wan of the Miri Catholic Church was laid to rest at the Catholic cemetery after some 3,000 people bade him a final farewell. 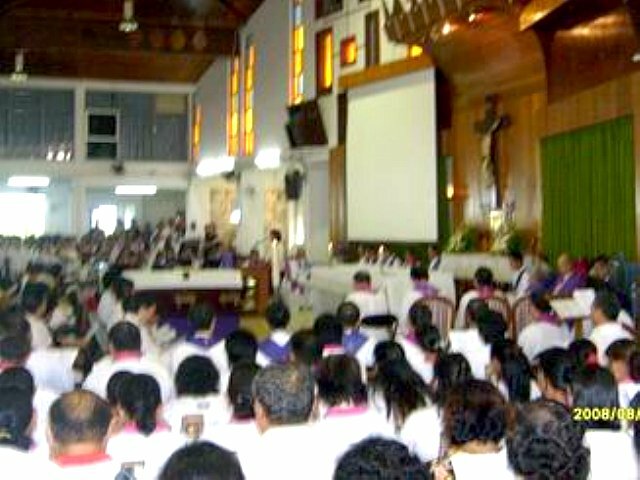 Father Wan, 60, who often walked for hours in the deep jungle to reach Catholics living in remote areas, died on Thursday night of heart failure on 20th August 2009. 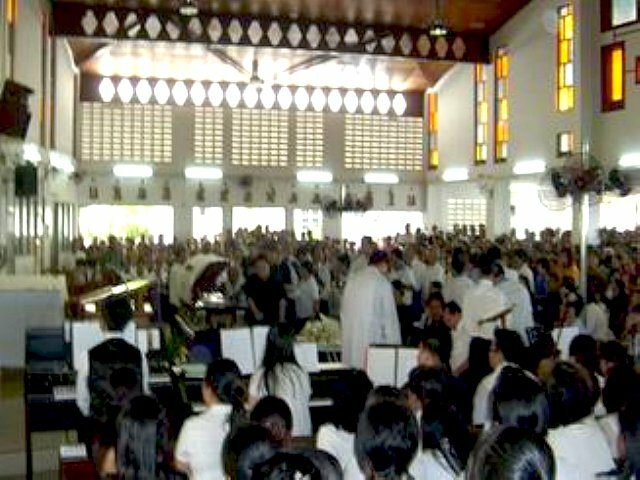 His funeral service was presided over by head of the Miri Catholic Diocese Reverend Bishop Anthony Lee Kok Hin. 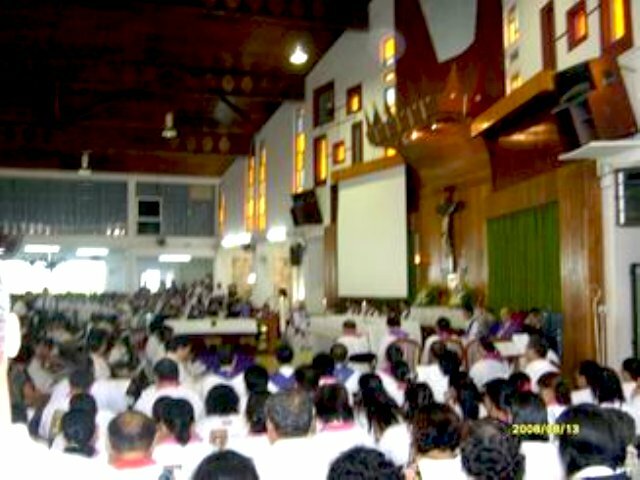 More than a dozen priests from throughout the state and neighbouring states also attended the three-hour service at the jam-packed St Joseph Cathedral in Miri. 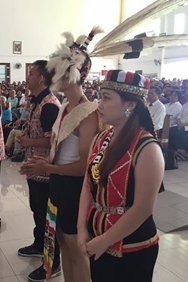 Caroline Dungan, in her 20s, who came with her family from a longhouse in the Long Lama sub-district some six hours by timber road, said Father Wan was a special person who had served God with absolute dedication. “Father Wan would walk more than five hours through thick jungles and swamps from the nearest jetty to our longhouses. “Sometimes, when it rained, he would arrive totally drenched, and he joked that he had swam all the way in the Baram River,” she said. Bishop Lee, who had known Father Wan for close to 40 years, said the deceased was an exceptional man. 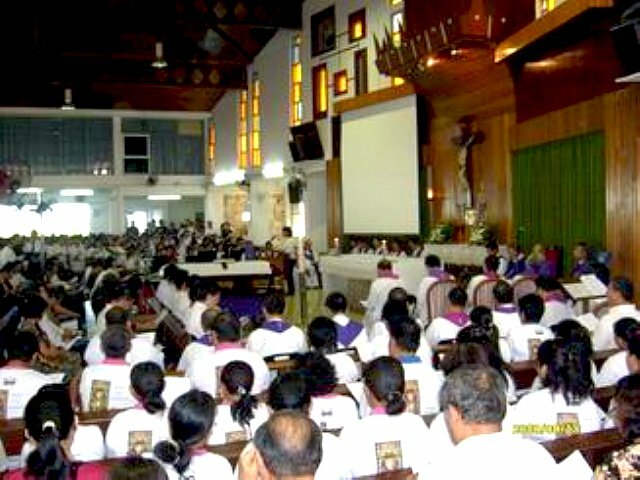 MIRI: One of Sarawak’s pioneer and most notable local priests Rev Father Anthony Wan died on Thursday night at the intensive care unit at Miri Hospital. 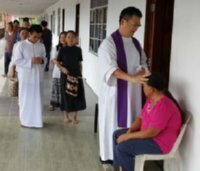 Father Anthony, 60, was hospitalised three days ago after having breathing problems while he was in Batu Niah town, some 120km south of here. 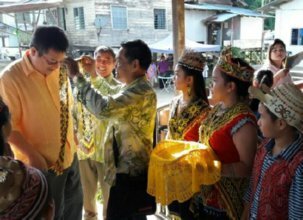 His death is a great loss to Catholics in the state as he was one of the most dedicated Sarawakian priests and a noted spiritual healer. 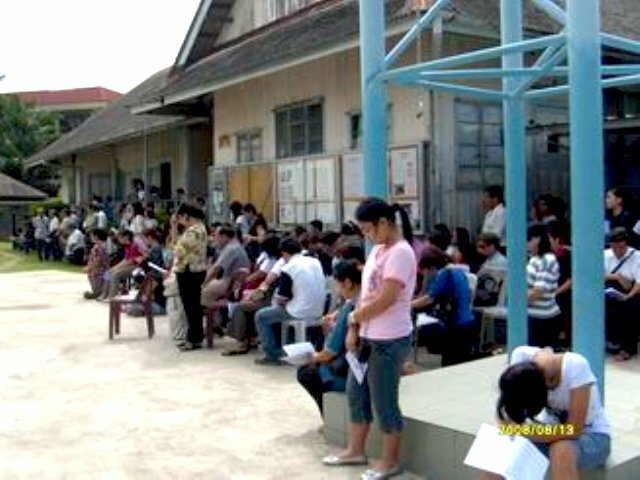 There are more than 60,000 Catholics in the Miri Diocese in northern Sarawak. 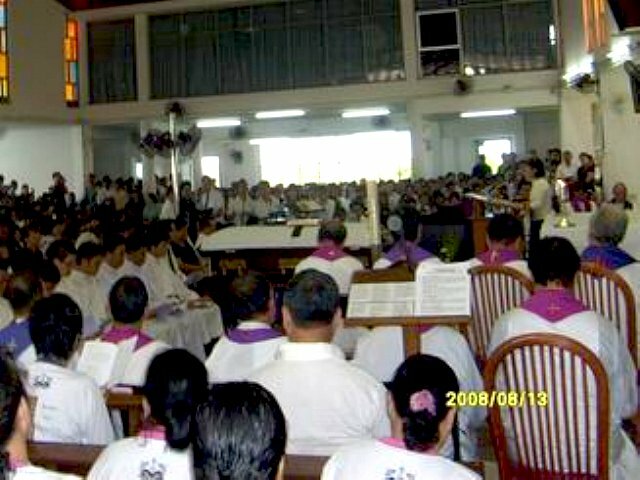 The Miri Diocese encompasses Lawas, Limbang, Miri, Baram, Niah, Bintulu, Belaga and the Bakun interior. 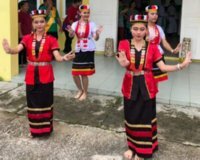 Father Anthony had helped to spread Christianity to the far reaches of the remote jungles of northern Sarawak, living in isolated settlements among the native ethnic groups, especially among the Orang Ulus like the Kayans, Kenyahs and even the Penans. Father Anthony often had to travel long distances on rugged and rough timber roads, enduring long journeys each time. All these he did despite suffering multiple ailments that had caused him great pain. 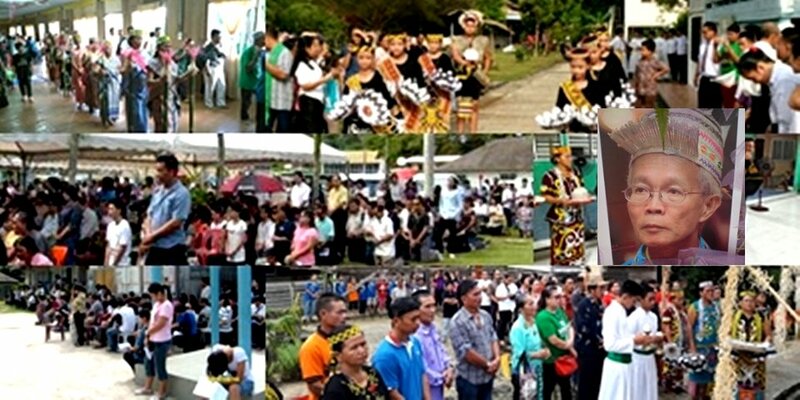 Father Anthony always preferred to serve poor natives in rural Sarawak despite his physical suffering and had been reluctant to be stationed in the cities and towns for long periods. His last posting was in the remote settlement of Long San, seven hours by timber road from here. Father Anthony was multi-lingual. 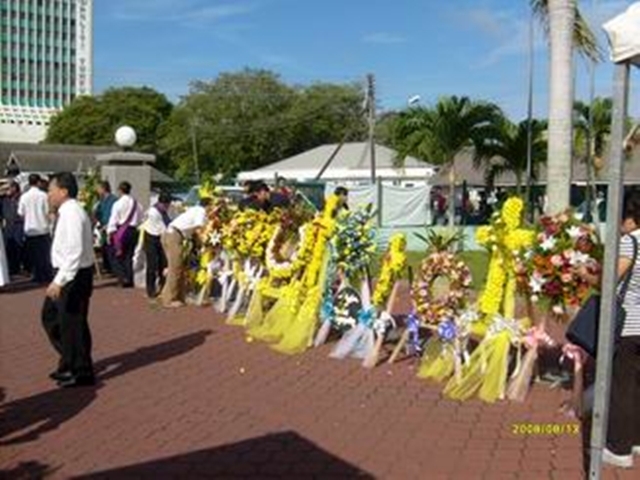 He was proficient in English, Bahasa Malaysia and Mandarin and some of the natives’ ethnic languages. Father Anthony had served almost 40 years in the priesthood. 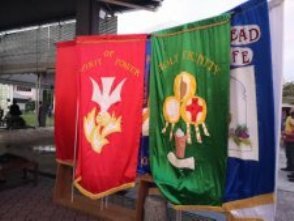 During a grand 60th birthday celebration two months ago organised by parishioners for him, Father Anthony spoke at length on the need for people to forgive one another. “Forgive readily from our hearts those who have hurt us,” he said. Ironically, during the dinner, he also spoke about how he would face death with confidence and inner peace. 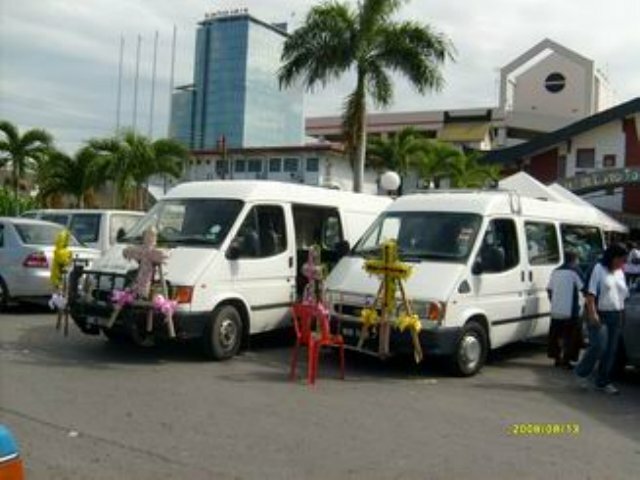 Father Anthony will be laid to rest at the Catholic cemetery here after a mass at St Joseph’s Cathedral in Miri on Monday. 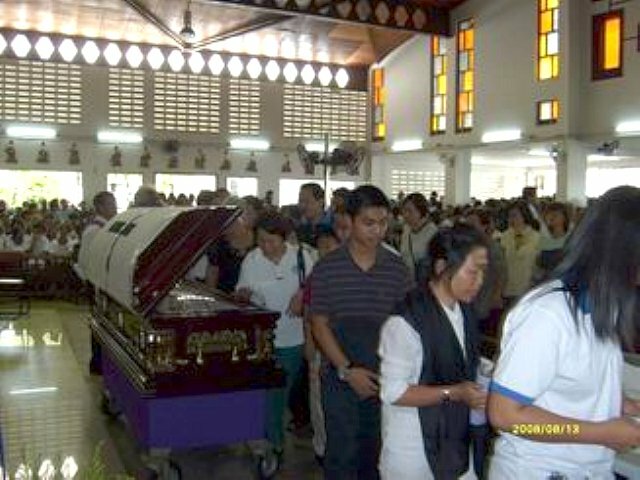 Fr Wan ia an example of a modern time matyre, who dedicated his life to serve and work for people And God. May His Soul will be together with all the Saints and Angels in heaven. 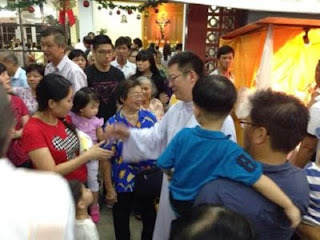 Fr Wan on behalf of my poor little family, I would like to thank you for all the great things that you've done for us especially spiritual matters. I believe you are smiling, happy and handsome in heaven now looking down at us as we knew that you ran a good race until the end. 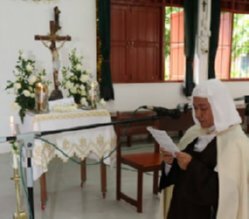 Fr Wan please pray for us down here ask Our Lord Jesus to give us the strength and humility of hearts the same one that He gave it to you during your whole life here serving Him. 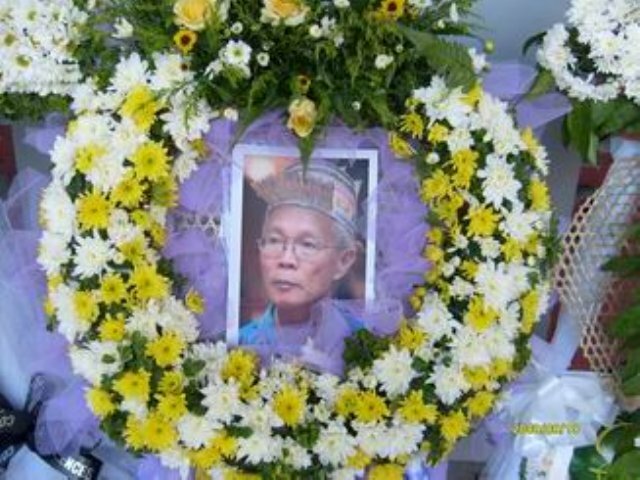 Once again Fr Wan, we love and missed you very much. 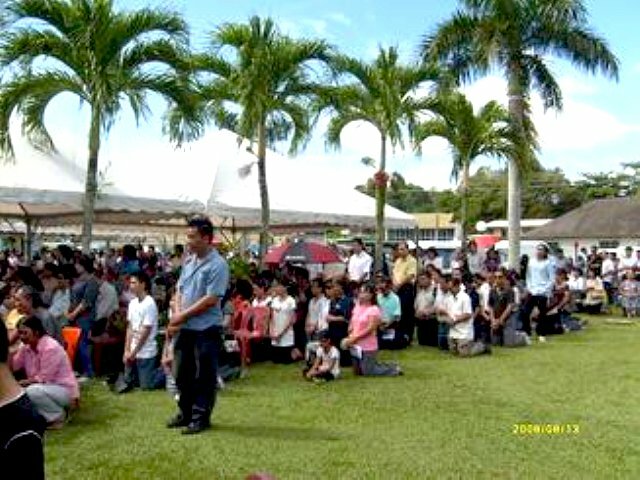 Thank you for praying for us Fr Wan. Christmas reminds of the joy you shared each time we'r in ur company. We always feeled realax and at peace whenever you are arnd. We still miss you very much dear Fr. Wan. You r still very much alive in our hearts and fellowships. MERRY CHRISTMAS N BLESSED NEW YEAR SPECIALLY TO YOU DEAREST FR. Wherever you are... do always remember to pray for us. We still need your prayer, guidance and support. Christmas is about God coming to us wherever we are. By my own extension (I could be wrong), "wherever" also imples the frail state we are in due to our sins and weaknesses. 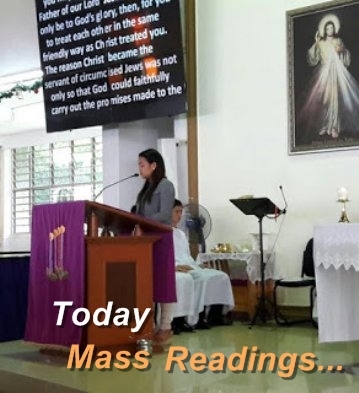 This was the focus of the sermon given by a priest during a Christmas mass in Kuching. This Christmas message reminds me of Fr. Wan, who in his love of God and His people, always tried to reach out to the people with (Christmas) joy whom God has commissioned him. Because of him, many have seen the salvation of God. Wherever you are, Merry Christmas Fr. Wan. Dearest amai, the most treasured gift@lesson u had taught me is to have a heart of HUMILITY and SIMPLICITY. Tq 4 being a role model of both in your own very special ways. 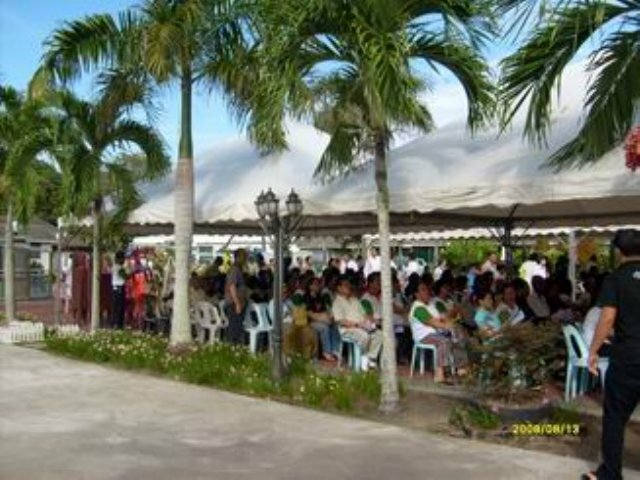 during myself stayed with Fr .wan 2007 ,he said to me that"kung lahat tayo ay magaalay ng ating mga sarili ng buong puso at kaluluwq sa panginoon diyos, kompletong kapatawaran ng mga kasalanan natin, at kompletong pagpapatawad sa mga taong nagkasala sa atin"????? 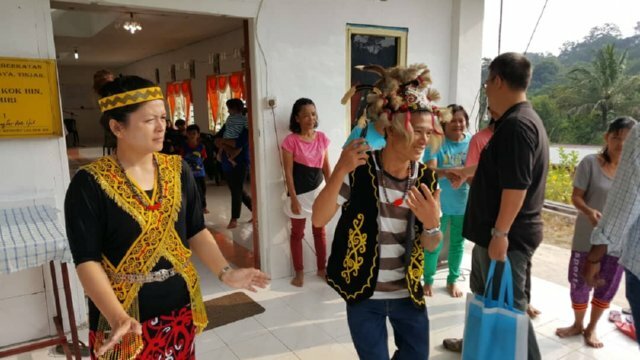 masa sangat cepat berlalu sehingga tak terdaya mengingati peristiwa permergian fr yg sangat kami sayangi dan permergian dia satu kehilang yg sangat besar dalam diocess mirri pada hari , namun iya tetap kami ingat dalam kenang . Beliau telah menebusi batas langit menemuai Allah Bapa di Sorga . Amin. Fr. Wan always say "give back to God what ever you receive and He will give you more"
Fr.wan always reminds us , don't worry about lives God wil proviod , just pray to God and the word come from his mouth during Fr. Joseph and myself stay in Lapok 2007 is" a-kapia"
Fr. only God knows the struggles u went thru that's why He lovingly calls u home. No one can understand His glorious mysteries. We mourn, we miss, we cherish... but He knows what is best for His beloved servant.... Silently, your memories constantly remain in our heart. How can we ever 4get u dearest amai wan. 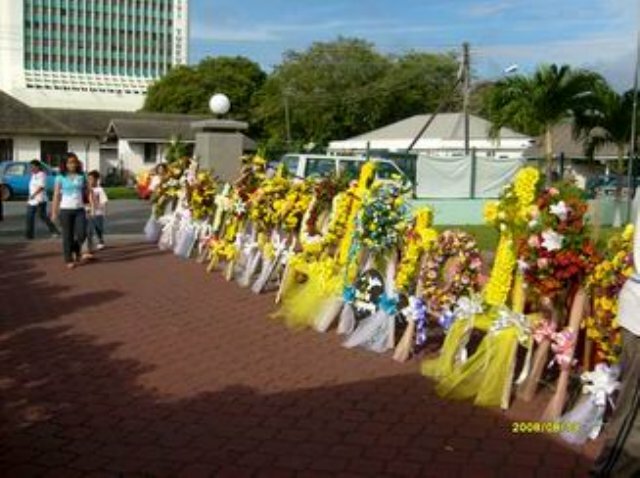 Fr., remembering u is easy, we do it everyday. Missing u is d hardest part as it never goes away. To hear ur reassuring voice, 2 c d warmth of ur smile, 2 sit in ur companion n talk a while would be our greatest wish and longing today, tomorrow and always. U shall always remain in our hearts dearest fr. May God lovingly embrace u in His loving arms. "CHRIST THE POWER AND WISDOM OF GOD" a rythmic word as u go forward to fight a good fight..now that God have gloriously await you into his kingdom where you would see and know your true Father beloved Rev.Father Wan..May your soul rest in peace! Saya dan keluarga mengucapkan takziah buat Fr.Wan sekeluarga.. We gonna miss you fr.wan.. Nasihat dan kenangan bersama Fr.Wan akan sentiasa segar dalam ingatan dan berkembang mekar dalam kehidupan rohani kami. Rest in peace, fr. We'll pray for you..
Fr. 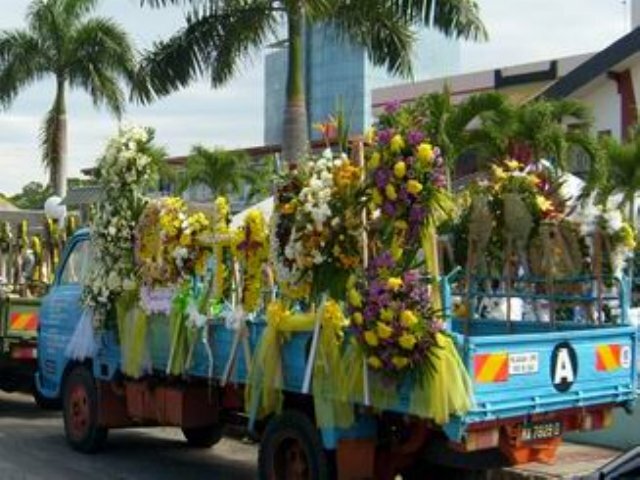 Anthony Wan’s passing was surely a sad moment for many though we should also rejoice that this true servant of God has earned his well-deserved rest in the Lord after fighting a good fight for God’s kingdom. ‘How beautiful on the mountains are the feet of those who bring good news, who proclaim peace, who bring good tidings, who proclaim salvation, who say to Zion, "Your God reigns! "’ (Isaiah 52 52:7) . Indeed, blessed are the much-travelled feet of Fr. 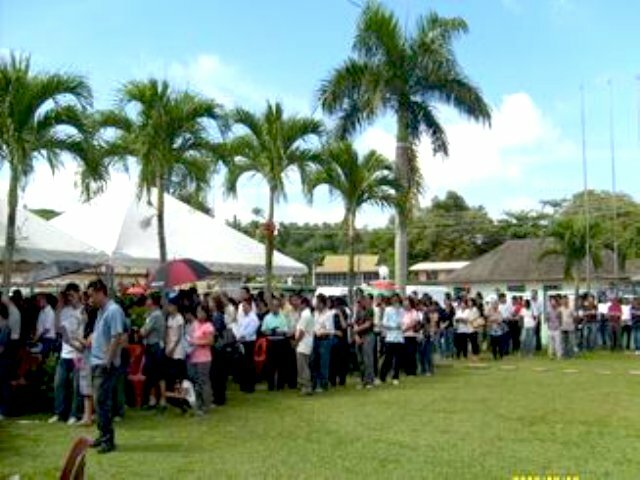 Wan that had done countless miles for the sake of the Lord’s sheep. Many, especially the rural folks, will surely miss his feet. Very much missed, dear Fr. Wan, and thank you. 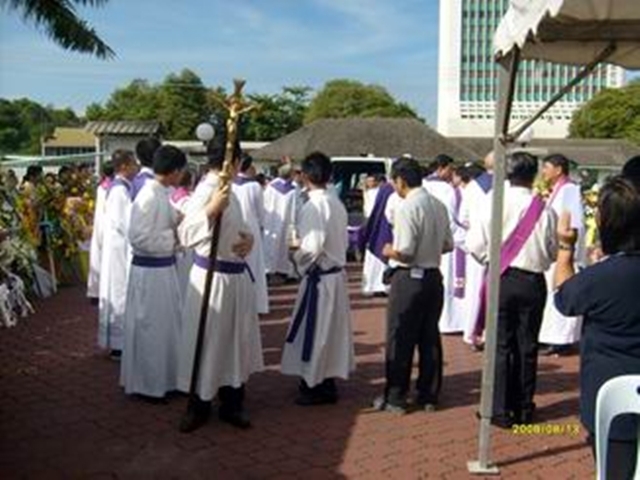 'VERY VERY VERY SIMPLE PRIEST',said Bishop..I Love u Amai Wan. Dearest Fr. Wan. Though u r gone, ur presence is still very much felt. You r very much alive in our hearts. Fr. the lesson u taught me r very precious. U taught me hoe 2 b strong, how 2 get up after a fall, how 2 sail a stormy sea. You taught me how to accept others for who they r despite of their flaws, that they r God's loving creations. Fr. 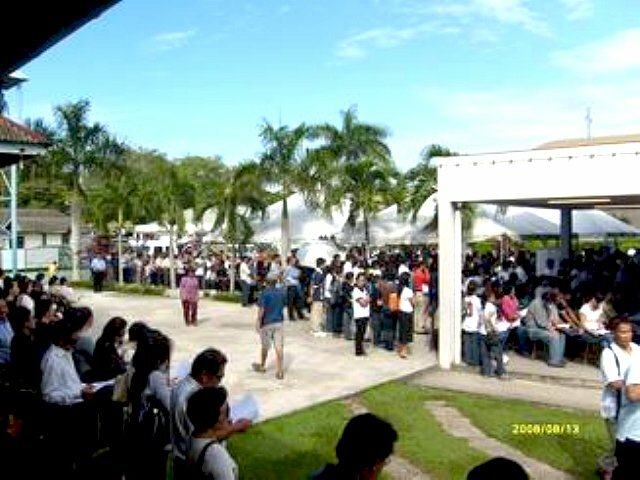 I will try 2 do as u taught me... "not 2 b fast in judging others..." I miss u dear Fr. I miss ur words of encouragement, words of reassurance. Each time thoughts of u come by, tears will swell in my eyes. REST IN PEACE DEAR FR. 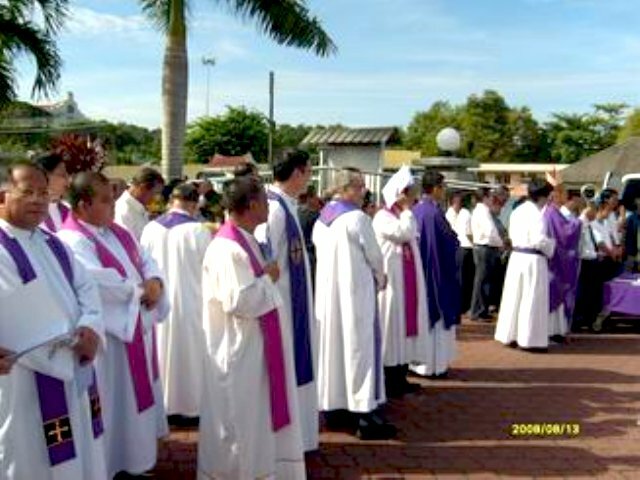 Miri Diocese has lost a wonderful and holy priest. I have had the privilege of knowing him since before his Ordination. He was a man of God, a man of prayer. He loved all God's people. May he rest in peace. Amen. 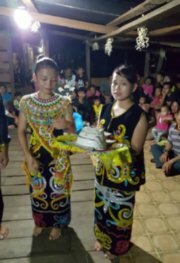 Minggu berlalu dengan pantas, namun kenangan bersama dengan mu masih segar dalam ingatan...Rindu akan kata-kata semangat dan senyum manis mu yang sentiasa mendamaikan.....love you "Amai Wan"
DON'T WAIT...TIME CAN CHEAT YOU ! 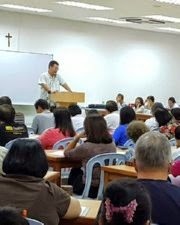 ...a very encouraging words from Fr Wan on my vocation to Carmel. A week had passed since u left us so suddenly and quietly without a word of goodbye. 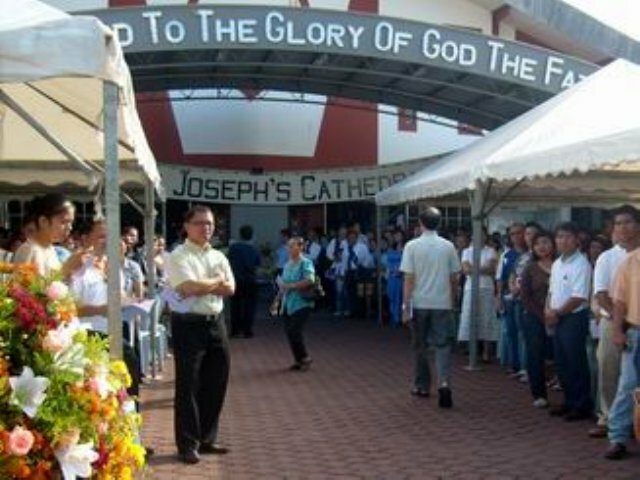 We dearly miss u fr. Ur smile, ur presence, ur "hi" and most of all ur words of encouragement and reassurance. I believe u r watching us. Pray for us fr. that we may be save and one day we will meet in heavenly paradise. Rest in peace dear Fr. Memories of u will forever be fondly cherished. 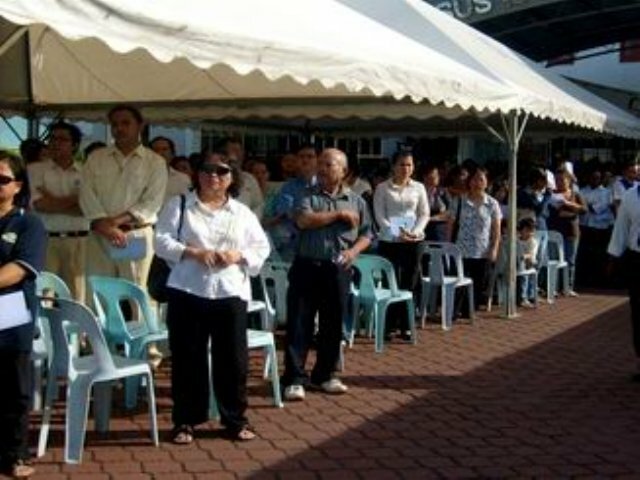 kami sekeluarga sangat sedih dengan 'pemergian' Fr Wan.Semoga dia berehat dengan Damai. Kami Sayang Fr Wan. Till now ,I still feel very sad.But it is God's will to call him back to heaven.Fr.Wan was a wonderful , soft spoken priest.He played guitar well,I enjoyed his singings.What a sad thing that I dun have the chance to show him those beautiful photos we took during Sr.Doreen's grand occassion in Tangkak and those were taken in Beautiful Oasis Bay Restaurant .Rest in peace ,Fr.Wan and pray for us ! We have lost one of the blessed Priest among us..
God, please bless Fr. Anthony Wan. Please bring him to sit among the blessed Soul. We will always remember you Fr. Wan. 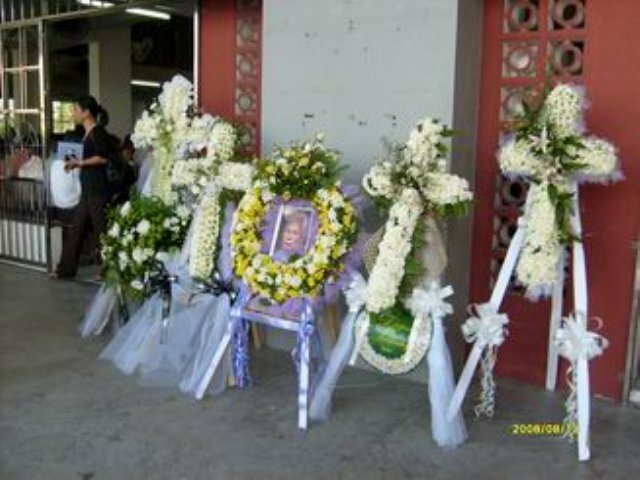 Indeed, I felt very sad and in tears during the funeral. It is God's plan for His people. Fr. Wan was like our own family members. He was very close to my Uncle Tom and my family. He treated my grandmother like her own mother. 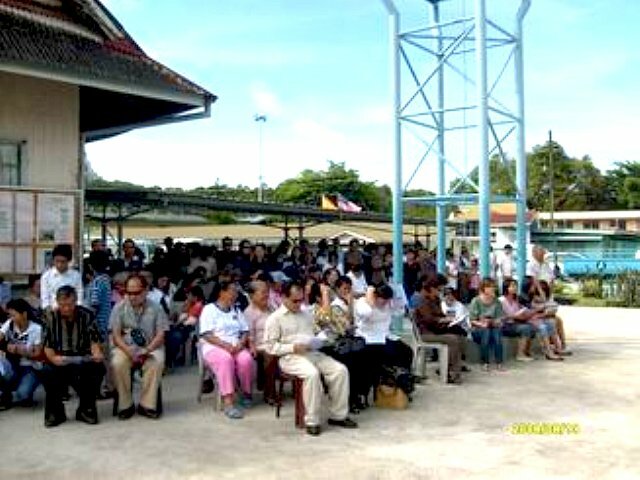 He shared the Christian faith with us when he came to Miri. He taught us to pray, to forgive and to love one another. I'm happy and glad to see him in my wedding dinner last November, praying for us. 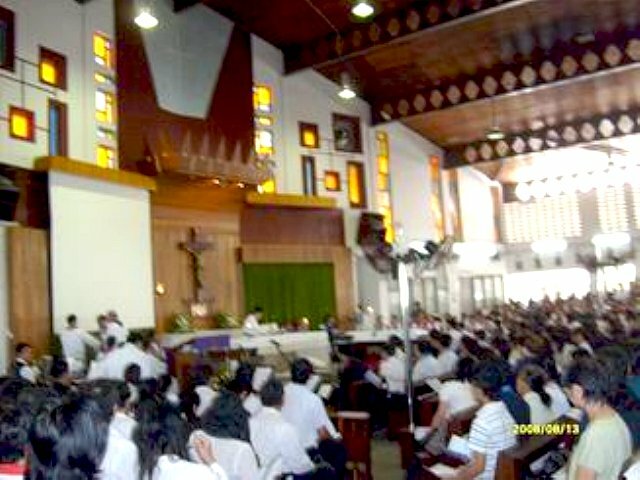 He was a holy, humble, energetic and dedicated priest for everyone. I admired him as he could speak many languages. I even lose him in speaking Penan language as a Chinese. May he rest in peace. Fr. Wan, please pray for us. 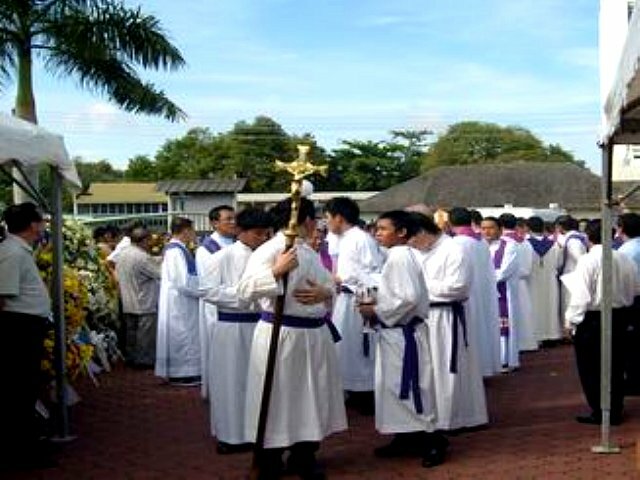 The family of Fr. 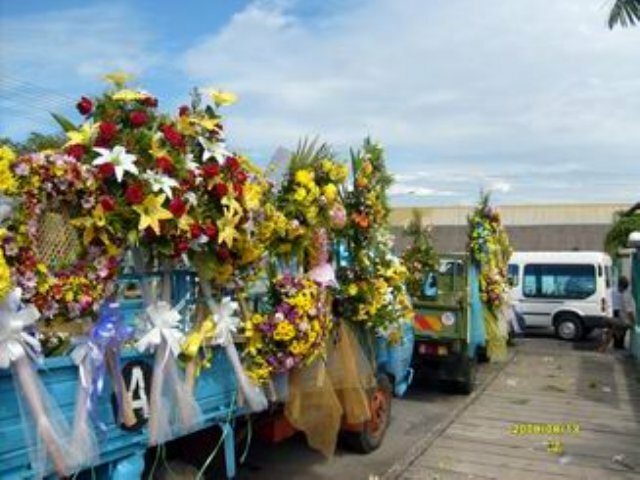 Wan, please accept our condolence. May God Bless his Soul.. Rest In Peace.. Amen ! 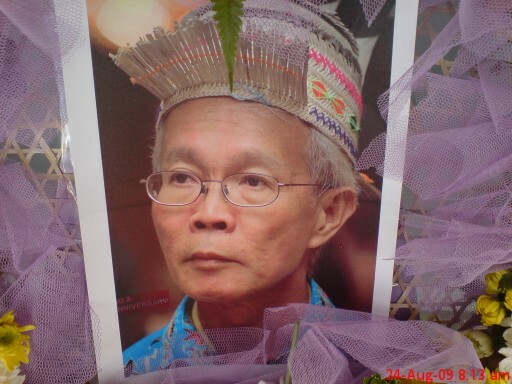 I was shocked and burst into tears when I learn that Fr.Wan has left us so soon.I was baptised by him in 1986 in Limbang.He was indeed a dedicated priest.I last saw Fr.Wan was in Dec.2008.Whenever he came to Muar,he visited my family.I was always so joyful to see him.I still remember vividly when he was in Muar , we had a very happy gathering.In conjuction with Sr.Doreen"s decades of service to God in Tangkak , Fr.Wan,two other priests from Sarawak,Sr.Doreen,Sr.Aloysius and my family went for dinner at Oasis Bay Restaurant in Muar ,he was attracted by the beauty of nature which was created by God.At this sad moment,my deepest condolence to his family and siblings,may his soul rest in peace with all the angels and saints in the name of Jesus Christ our Lord.We love you Fr Wan and thank you for all your guidance and love. we will always remember you! sangat sedih mendengar kepergian father wan.satu kehilangan bagi semua umat dimiri.semoga roh father wan didalam kerahiman tuhan yesus. FATHER WAN DOAKANLAH KAMI ANAK MU AMIN. 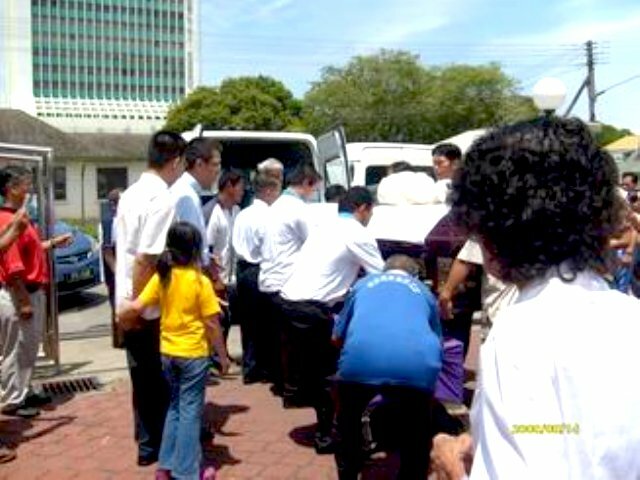 My sincere condolence to the familes and the people of Miri on the death of Fr Wan. 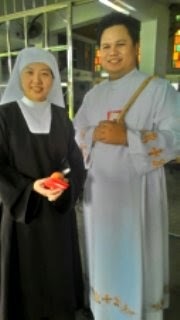 Fr wan is indeed a holy and devoted priest. 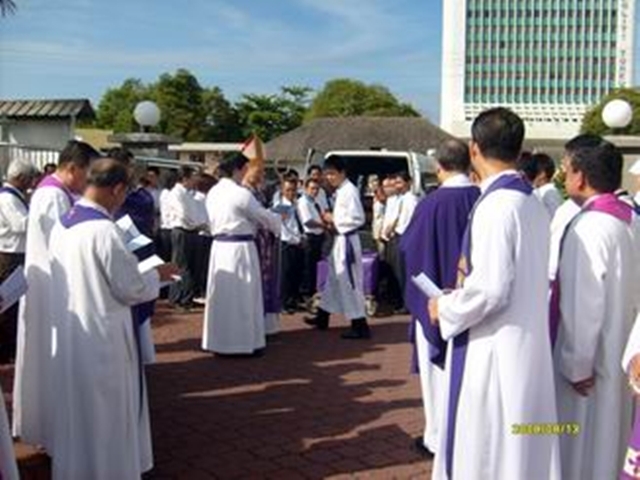 It is a shock to learn of Fr Wan Passing. 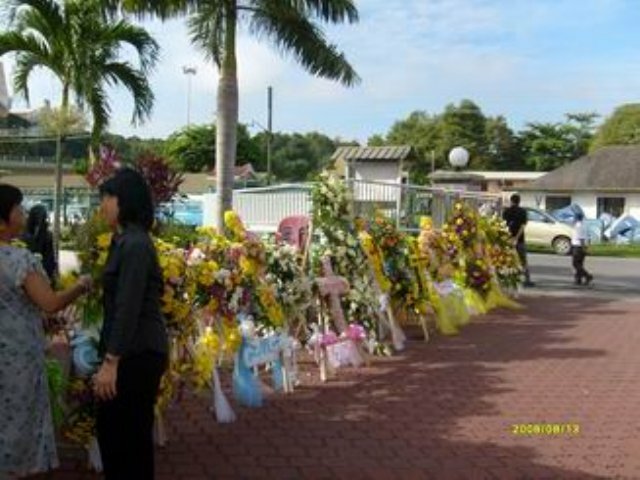 My sincere condolences to the People of Miri Parish. I met Fr Wan in my early years and I know he has done much for the people. He was indeed a good shepherd. We can be sure he is now is heaven and still serving us.